There are a lot of things we do without much conscious thought — habits we've developed over time. Some habits help streamline our lives for the good; others, though, hold us back or even harm us. A lot of these habits, both good and bad, form during our childhood years. That's why it's important for you to guide your children into forming good habits. The goal is that when they're adults they'll “own” these habits, and their life will be healthier and happier because of them. One particular area of habit-forming focus is dental care. It's essential your children develop good habits caring for their teeth and gums. The most important is a daily routine of brushing and flossing. Brushing and flossing has one primary aim: to remove bacterial plaque, a thin film of food particles that builds up on tooth surfaces. Bacteria in plaque are the main cause for two potentially devastating diseases, tooth decay and periodontal (gum) disease. Allowing plaque to build up over just a few days can trigger an infection that inflames the gums or softens enamel leading to tooth decay. Left untreated these diseases can ultimately cause tooth and bone loss. A daily habit of brushing and flossing, along with semi-annual professional cleanings, can drastically reduce a person's risk for these diseases. It's best to instill these habits and their importance as soon as your child's teeth begin to erupt in the mouth. In the beginning, you'll be performing the habit for them: for children two and younger use a slight smear of toothpaste on the brush. As they get older, you can increase it to pea size. Eventually you'll want to help them learn to brush on their own. 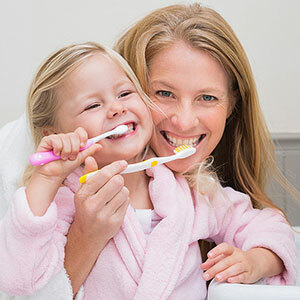 In this case, modeling the behavior — both of you brushing your teeth together — will have the biggest impact and help them see how important the habit really is. Before you know it, brushing and flossing will become second nature, a habit they'll begin doing on their own without being told. Once instilled, it'll be a habit they'll practice long after they leave your care — and one they'll hopefully pass on to their own children.